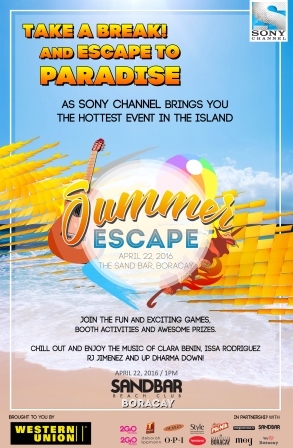 Sony Channel steals the scene as it hosts this year's Summer Escape in Boracay. Fun-filled summer activities await the participants in this event happening on April 22 at The Sand Bar Station 1 in Boracay starting at 1PM, to be hosted by Jaz Reyes. In the evening, the mood is set with special performances by Clara Benin, RJ Jimenez, and Up Dharma Down. To participate in this event, guests need to register by liking Sony Channel's Facebook page. After which, they’ll be given an ‘event passport’ which they could use to participate in different activity booths, and enjoy the evening performances as well. Guests can also make memorable beach moments with henna tattoos, hair braids, massages, nail art, bead buffet, printstagram, giant beerpong, and more! Plus, Sony Channel will be giving away exciting freebies for its summer loving guests.